A street mural is coming to one intersection in Palma Ceia in hopes that it will slow people down. 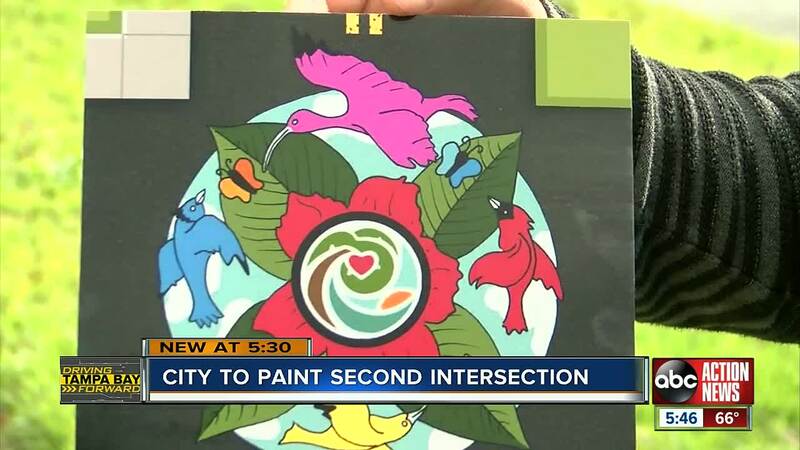 TAMPA, Fla. — A street mural is coming to one intersection in Palma Ceia in hopes that it will slow people down. Along a stretch of Stirling Avenue, near Corona Park in Palma Ceia, there are no stop signs and no crosswalks. “This is a very walk able neighborhood so when you have a street like Stirling where people are going very quickly, you need to find other ways to get to them to slow down,” said neighborhood association member Emily Hinsdale. That’s where the street mural comes in. Seminole Heights got one and people there say it’s making a difference. The Palma Ceia neighborhood association picked artist Ben Donnell to paint one there. “Maybe they’ll see below them this paint and respect the art. And maybe say you know what? Maybe there’s kids around here. We need to look left and right and not zip through,” said Donnell. He says the design combines native plants and flowers with birds, butterflies and the Palma Ceia logo in the middle. “When you see something visually. Bright colors. Yellow. Red. That’s when you stop. That’s when you find out what it is,” said Hinsdale. Using street murals as a way to calm traffic and slow drivers down is a growing trend. Several others are in the works around Tampa. The painting begins at daylight on March 3. Volunteers are welcome to help. A neighborhood mini-grant from Hillsborough County is funding the project.